Carny Class is a mix of the different skill classes we have here at The Last Carnival. 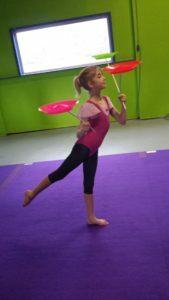 This is a great class because it will give your child a bit of everything circus. Carny Class brings together skills from our adult classes and workshops tailor fit for the learning of young minds and bodies to give your young circus enthusiast ground and aerial skills training in a fun yet focused environment. Each week we will start with group warm up activities. 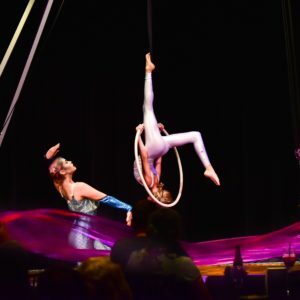 Carny Class will focus on aerial skills on the static trapeze, lyra (aerial hoop), hammock, and aerial silks. The ground based circus arts will include flexibility, partner acrobatic skills, as well as an array of different circus props to help focus on balance, coordination, and object manipulation.To do this we will use the rolla bolla, juggling props (hoops, rings, diabolos, scarves), feathers, twirling ribbons, hula hoops, and spinning plates to name a few! Safety is a top priority for us, the instructor will be spotting students and all aerial activities start just a few feet off the ground with crash mats and gymnastics flooring below. There will be room for 6 in each class, so make sure to get your child signed up early to reserve their spot. Classes will now be divided into age groups so each child can get the best training with other kids their own age . Instructed by Sihka. Sign up on through The Last Carnival calendar page. Carny Class (Ages 6-12) This is a 45 minute class and is only $15/class when you sign up for the 6 week session. No prerequisites. Carny Class (Level 2) This is a 45 minute class and is only $15/class when you sign up for the 6 week session. You must have permission from Sihka to join this class. Carny Class (Student Performance Ensemble) This is a 75 minute mixed age class. $20/class. You must sign up for the 6 week session, have an interest/ availability to be in student performances, and have instructor permission to join this class.